"Thurlow Rogers' winning margin yesterday at the USA Cycling Masters Nationals was three seconds. It would have been a few minutes if not for an attempt at generosity. 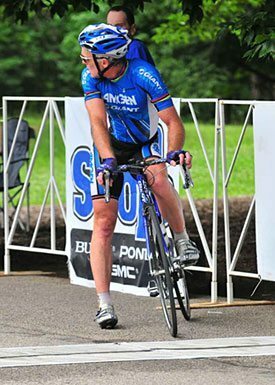 Rogers, the defending champion who was dominating the men's 45-49 age division race at Cherokee Park, abruptly stopped just before the finish line of the 10-lap, 50-mile course. Rogers, who has won several national titles, waited until the rest of the cyclists finally caught him. He glanced to see who was second before quickly crossing the finish line to win the title. The Simi Valley, Calif., cyclist said he was hoping the rider in second place was one of his two teammates. They were farther back, but he was prepared to give one of them the national title." team work and winning on the sacrifice of team mates is one thing and part of what makes this a cool sport, team mate stopping and waiting for "a few" minutes seems like charity, not team work. I wouldnt want to win as a result of charity. If you don't care if you win, then why race? "Oh, I'll give the race to you, but not to him!" No ... that doesn't work for me. I would have been upset at Thurlow if he just gave me the win. If he wants to help, he can pull me off the front or give me a killer leadout. Working for a person is fine, but just handing it to someone devalues it in my opinion. I'm sure there's more to this story, though. The only thing is I think that team is the most stacked team around (?). If that's true it would be nice if the racers spread themselves out a bit more, at least for their competitors. I once punctured at a race at Bethel, got a wheel, rejoined. Since I thought it was no free lap (wasn't announced prior to the race and I honestly didn't remember specifically saying there was or wasn't one on the flyer) I figured I'd just ride. I figured the official let me in because it was just a training race. I decided to lead out a teammate, went super hard for the last lap, ended up riding away from him and everyone else. Came to the finish line at the top of the hill, stopped about 10 feet before the line, dismounted, and cheered everyone on (they were perhaps 10-20 meters away after I'd completely dismounted). Afterwards the official asked why I stopped. Told him I was a lap down due to no free lap. He said that I made too big an assumption about the free lap and that there was a free lap. That was kind of ironic because it was my race. lol. I don't want to win that way. Two guys in a break, he thinks I've earned it through my work? Great, I'll take that every day of the week. But here, 2nd place was clearly inferior. This is one gift not worth receiving. Last edited by ElJamoquio; 07-07-08 at 10:17 AM. Finishing second to Thurlow is a win in itself. Or so I've heard. Terrible and an insult to your team mate. I would not be happy with him. Sitting up when in a break because you feel the other guy did more work, fine. But to just stop for a full minute or more is just wrong. Keep in mind that Thurlow Rogers was probably one of the most gifted cyclists of his generation. 3rd in the Peace race with virtually no team (the Eastern Bloc version of the Tour). Super consistent in various races - Olympics, Worlds, etc, no hint of doping (even in the somewhat blood doped 1984 Olympic team), etc etc etc. He's a star in the star-laden Socal scene. Because of this, he's probably the defacto team leader every time they line up. As a teammate, if you have such a strong teammate (think Greg Lemond, Bernard Hinault, Eddy Merckx, etc), and you basically work every race for him, then any gesture by that leader to try and repay the favor, I think, would be received as a generous and kind one. Part of the reason he might have had such a big lead of 3 minutes is that there were two teammates covering any and all moves in the second group. Although a strong racer can eventually crack a chase group, it's much easier if there are teammates disrupting the chase, physically or psychologically. I think one of the things this proves is that although Thurlow Rogers will take the win if he "has to", he would have preferred someone else on his team be the National Champion. Look at his kit - he already has world champion stripes on his sleeves. I'm sure he's won a boatload of Nationals. Now he wants to spread the wealth. To me that's pretty cool. After reading Aki's explenation I think the gesture was a good one. In most other cases I think it is better not do to something like that. This is exactly what I was thinking. And he still won, right? Who cares if it's by 3 minutes or 3 seconds. And if he's the guy on deck; the guy that it is pre-determined that his teammates are working for; then his teammates don't have a chance to win the race at all. But if he's got a few minutes lead, then he knows that his teammates will be working for second place amongst themselves in the last few miles (since he's already safely home); if one of them is on a last mile breakaway, then it's a one-two punch. Either his teammate (who worked so hard for him and who is leading the pack for "second" place to the line) gets the win, or he does. Both are wins if the team is racing as a team. Amongst the teammates; they know what the score is and who is stronger than who. The gesture is one of good will and a true gift. From my one season of racing so far, I've gotta tell you, there is only one better feeling than crossing the line first (I've done that once): that is to help a teammate win when you don't have the juice to contest the finish yourself. To have all the hard work of controlling the chase for the sake of a much stronger teammate be rewarded by actually getting the win instead of second place would be a nice gesture. If the dice had rolled that way, I'll bet that the teammate who was gifted with the win would have a special place for that championship trophy. And God knows that everyone knows the score. I know who Mr Rodgers is/was but still say what he did was wrong...... Gift??? Keep your gift as I want to earn that stars n stripes jersey or at least win it in a different way than have the leader sitting 1m from the finish waiting for me to cross. I left the park where the race was being held for some other appointments when it was clear this race was in the bag. Now I wish I had stayed to see the situation play out. On a related note, it was great having the Masters event in town. The crits yesterday were enjoyable to watch because each race (of the ones I watched) saw different strategies in play. Great E.Q. esammuli! Well done. I don't know Thurlow well enough to comment on this. Or maybe I should feel more free to comment. The guy has paid his dues and has done some amazing things on the bike, but it seems a bit of an insult to all the other riders in the race to lord over them and decide who gets to win. Pushing your teammates across the line ahead of you is a more common way to do it. But to ride away from the field and THEN wait at the line isn't a bike race tactic. It's a gesture of some sort, but it's also rubbing your opponent's nose in it. if you want your teammate to win, then work for him in the race. Seems Thurlow could dominate it well enough to do so. ^ Yes, Thurlow could have worked a plan out with his teammates to make a break where he would do most or all of the work and set them up for the win. That's racing imo. if you want your teammate to win, then work for him in the race. Did Thurlow set a record for the lowest velocity nationals finish? Maybe that was the team plan? Meeker and Rodgers lapped the field in the crit championship. Meeker then won a sprint from the field for his national championship. I walked out of the infield where the race was held behind Meeker, he was explaining to someone that he had given Rodgers their state champ jersey prior to these races. That is true, I watched the two of them finish our District Champs in Bakersfield. They had a couple of minutes on the field and Meeker gave the win to Thurlow (Meeker would have won a sprint between the two). I think the deal was Thurlow would race for Meeker at our Crit champs, but Thurlow won that from a two man break. You guys get a jersey? My parents cleaned out the rest of the crap from my old bedroom and gave me a bag which included what I thought was my brother's state champion skinsuit from 1994, but after reading it, it said district champion on it! btw it was for boys 10-12 Track omnium, and he was the only entrant. Also, he got a skinsuit because they didn't offer jerseys in XS or youth sizes.